Are you ready to reinforce your students' addition with regrouping skills? Let these fluency task cards help! 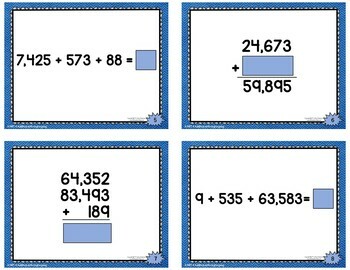 So what are these math task cards--and how are they different from others? I have found that the best instruction follows the formula known as CRA (concrete-representational-abstract). In a nutshell, this is a three step highly effective instructional approach for teaching math concepts. Step one is CONCRETE, and it is the “doing” of math which involves physically manipulating objects to solve a math problem. Students can see and touch the math which helps build understanding. Next is the REPRESENTATIONAL stage which can be thought of as the “recording” stage where students don’t use objects but may use drawings, tallies, or other “representations” to help them solve the problems. The last step in this approach is the most ABSTRACT stage and is also known as the “symbolic” stage. It involves using only numbers and symbols to solve a math problem. Some people refer to these as “naked number” problems because there is no story and no context. Problems like this should only be presented after students have experience in the concrete and representational phases. 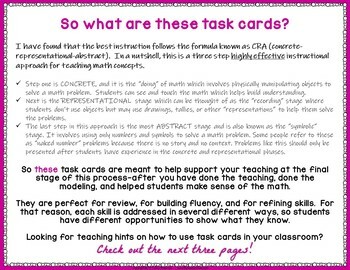 So these task cards are meant to help support your teaching at the final stage of this process—after you have done the teaching, done the modeling, and helped students make sense of the math. 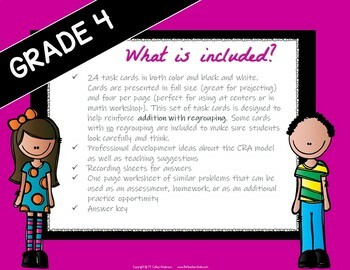 Each set of task cards in this series also gives you a set of teaching ideas for effective task card use! Let these be a little professional development at your fingertips. They are perfect for review, for building fluency, and for refining skills. For that reason, each skill is addressed in several different ways, so students have different opportunities to show what they know. It is so important to find problems that can help build that computational fluency while presenting problems in different formats. 24 task cards in both color and black and white. Cards are presented in full size (great for projecting) and four per page (perfect for using at centers or in math workshop). 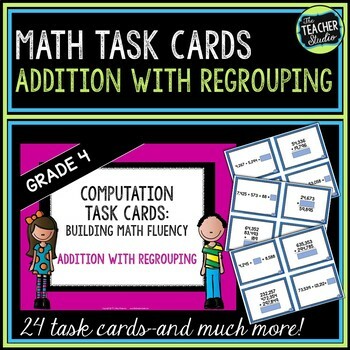 This set of task cards is designed to help reinforce addition with regrouping. Some cards with no regrouping are included to make sure students look carefully and think. Watch for other task card sets in this series! Looking for other addition resources? Try these! CGI Style Addition and Subtraction Problems "Select a Size"
All rights reserved by ©The Teacher Studio. Purchase of this resource entitles the purchaser the right to reproduce the pages in limited quantities for single classroom use only. Duplication for an entire school, an entire school system, or commercial purposes is strictly forbidden without written permission from the author at fourthgradestudio@gmail.com. Additional licenses are available at a reduced price.